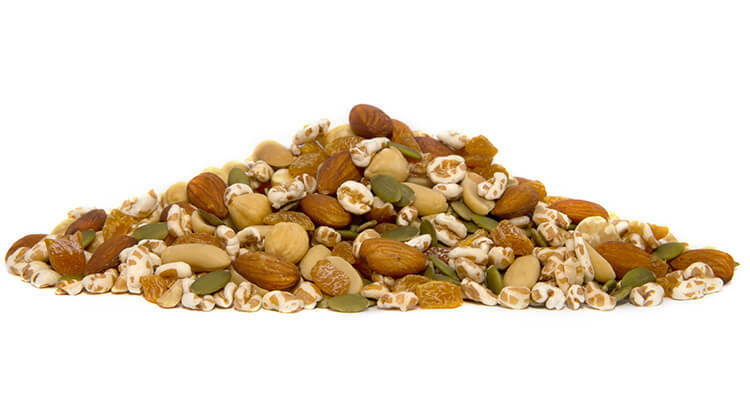 This delightful blend of roasted nuts (almonds, hazelnuts and peanuts) combined with puffed spelt, apricot and pumpkin seeds is rich in protein and fibre. Kickstart your day! Roasted Peanuts (Peanuts, Sunflower Oil), Roasted Almonds (Almonds, Sunflower Oil), Pumpkin Seeds, Dried Apricot (Apricot, Rice Flour, Preservative (220 (contains Sulphites))), Roasted Hazelnuts, Puffed Spelt. Contains gluten, peanuts, sulphites and tree nuts. May contain traces of egg, milk, sesame seeds, soy and other tree nuts.